Door lock is a very common object in life, and it is also a representative of security. With the progress and development of science and technology, now the door locks are more intelligent, the wireless networking technology applied to smart door locks, but also the performance of scientific and technological innovation. Wireless network intelligent lock system, the hardware adopts contactless IC card as the key, the communication using wireless networking mode, can achieve upload and record PC remote list issued by management software, real-time monitoring equipment, power door lock signal, online information, convenient operation and maintenance of customer. In the science and technology developed today, wireless networking intelligent lock system has become a modern management system, complete functions, far beyond the unit of the electronic lock simple requirements, but also helps to regulate the internal personnel management. It can not only keep a record in the offline / online mode lock operation control, limit the range of activities of personnel, politely refused to casual visitor will also protect the property, inviolability. Office of special traditional lock management problems have no way of knowing everyone unlocking each room, especially office area or leadership office door is damaged, there are illegal intrusion, not known; leadership or staff forgot the key, in accordance with the regulations, to the security department for the record, accompanied by security personnel to open the door, but time and energy shortage; especially for the new security guards, not familiar with the important leadership, easy to cause adverse effects; no key can not unlock, sometimes need to temporarily authorize someone entered the room is not convenient. With the key and can enter at any time, can not set the level of authority and time. An office sometimes forgot to lock the door at night, it is easy to lose things. And wireless networking smart locks can be a good solution to the above problems. ITPAKO wireless networking hostel smart card lock management system is designed for the dormitory and office building of the system, can be easily composed of a network of dormitory door locks and large networked office locks. 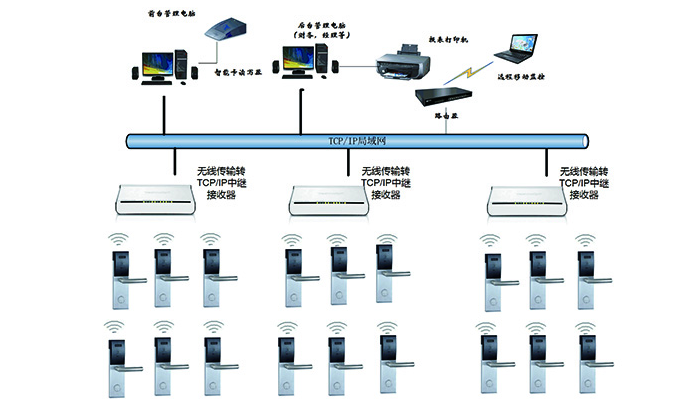 The management system of the intelligent card door lock management system of the wireless networking type dormitory is composed of a non-contact type IC card, a card issuing machine (also known as a reader), a door lock, a network communication and a door lock management software. The IC card management system based on Contactless IC card reading and writing technology. From the unified network platform, unified database, unified identity authentication system, secure data transmission and management system interface, exception handling and other software design technology to realize the account management system, the comprehensive performance of card terminal equipment intelligent system design to achieve the best. At present, many units have adopted and the campus card system, each user or student has a student card, the use of the original card manufacturers docking, read the original card system, access control system, opening night gate lock function in the premise does not affect the normal use of the students. The system adopts wireless interconnection star network, network and Internet connection. New use of ZIGBEE network technology, the use of intelligent networking dual backup system architecture (id/rewrite) core technology to ensure network stability. Exempt from the cost of wiring works, in the case of a short circuit, open circuit, etc. (including the power line), the door lock will not have any impact on the opening function. Door lock power supply using lock battery power supply. Power consumption is very low, the system is stable and environmental protection. The door lock is provided with a clock, which can control the effective time of the door opening. There is a valid time table, to facilitate the completion of scheduling management. Through the network computer can easily extract the door door record, the type of the effective card. Ultra low power technology: battery standby 5~15uA pulse up to 1000 data storage, data management is more secure. Machine data storage for more than 50 years, so that you use more at ease. Super real time technology: real time to upload the latest incident records, to ensure that the overall system performance. The computer can monitor the switch state of the door lock in real time. If the door is in the open state for a long time, the computer will send a warning signal to handle. Also can monitor the dynamic information of the door lock, the battery power, the signal intensity of the door lock, the room information, the data acquisition and the read out. With the gateway to easily connect INTERNET, door locks monitor global. With the original card system docking card system will be in the student card information is automatically synchronized to the access control system, when the student card in the card the system loss, cancellation, termination, hanging solution change card information are automatically synchronized to the dormitory door lock system.